This week’s adoptable is sweet Farley. “This special dumpling has one of those goobery faces that just makes people “ooh” and “ahh” everywhere he goes. With moments of surprising agility and snorts of happiness, he will waddle right in to your heart and take hold of it! Farley is about 1.5 years old and grew up in a hoarding situation with 21 other dogs…needless to say he loves to be with other animals and is a regular at the dog park! He finds Manhattan to be big and scary sometimes, but will brave anything w/ a dog by his side. Farley loves to play tug and snooze on the couch. 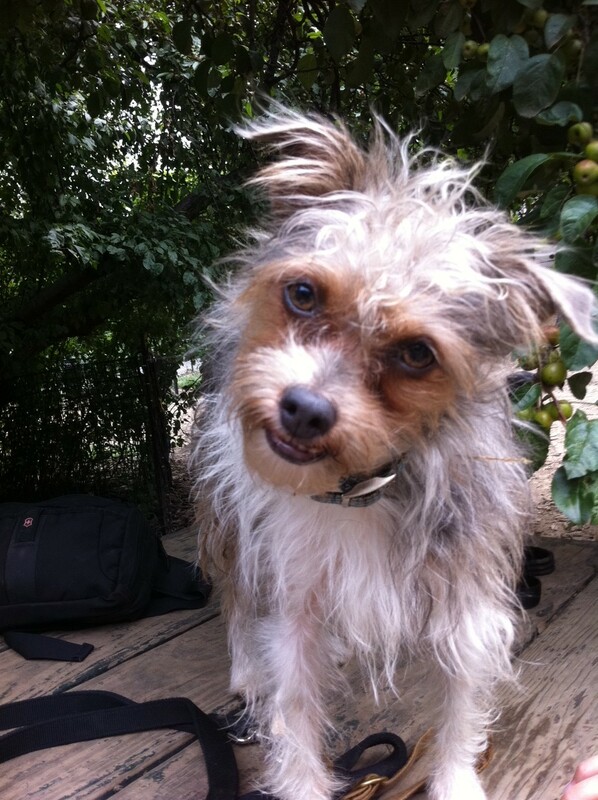 For more information on Farley, check out his profile on Petfinder. In New York, it seems like Halloween has gone to the dogs! Just take a look at the pics from the Tompkins Square Park Dog Run Halloween Parade. There aren’t many Pitties in these pics – maybe they are smarter and just watch from the sidelines? Because this is THAT TOUCH OF PIT, we need to share some fun pittie pics. 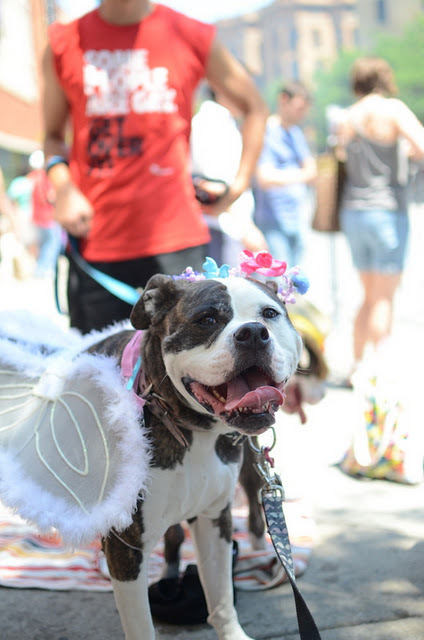 For more great pics of Pitties all dressed up…and, in JUNE, check out our friends at Two Pitties in the City. Anywho, back to Halloween in NYC… if you like to celebrate the spookiest holiday and can get dressed up WITHOUT your four-legged friend, why not attend the Mayor’s Alliance‘s first ever Creature Ball this Saturday at the Surrogate’s Court? Sometimes, the best way to get animals adopted is to bring them to the people! Adoption vans and offsite events are perfect opportunities to attract potential adopters. That is why we are so happy to hear that the Mayor’s Alliance for NYC’s Animals just received a brand-spanking new set a wheels from Petco! This will be a great tool to help the homeless dogs and cats of NYC find their forever homes. The van will go to great use this month with a very cool and innovative event in midtown Manhattan. Throughout November, the RS POP-UP at the Roger Smith Hotel will feature adoptable Alliance dogs and cats while also selling pet products and accessories from brands like Stella & Chewy’s, Sturdi and Ducky World. If you would like to check out the event, you can attend the special ribbon-cutting for the brand new Mayor’s Alliance adoption van on Wednesday, November 2, from 5:00–8:00 p.m. (RSVP to pr@lionesquemedia.com). Attendees will enjoy complimentary wine, Twisted Lemonade, and Pop Chips while meeting adorable animals for adoption or checking out the cool pet products for sale. In addition to the adoptable dogs and cats from the Alliance that will be shown everyday through November, on every Wednesday the adoption van will be parked curbside from 5:00–8:00 p.m. with even more animals for adoption from affiliate rescue organizations, such as Dog Habitat Rescue, KittyKind, MetroMalts, Picasso Veterinary Fund® of the Mayor’s Alliance, Posh Pets Rescue, Sean Casey Animal Rescue, and others. Have a great weekend, and please remember if you plan to dress up your pet, use these helpful tips from the ASPCA. Even though our fur kids can look pretty smashing in a pumpkin or pirate costume, many pets can have adverse reactions to a constrictive outfit or its irritating materials. Remember, pet parents, animals are most comfortable hanging out in their birthday suits. But in the spirit of all that’s ghoulish, the ASPCA offers some helpful costume tips to keep you and your pet singing “trick-or-treat!” all the way to November 1. Schedule a dress rehearsal and try on costumes well before the big night. Please don’t put your dog or cat in a costume UNLESS you know he or she loves it (yup, a few pets are real hams!). If your pet seems distressed or shows abnormal behavior, consider letting him go au naturale or in a simple, festive bandana. If you do dress up your pet, be sure the costume isn’t annoying or unsafe, and make absolutely sure it doesn’t limit your pet’s movement, hearing, vision or ability to breathe or bark. It’s best to avoid costumes with lots of sequins or other dangling parts that your pet could eat or choke on. If your pet ingests something poisonous, immediately contact your vet or the ASPCA’s 24-hour poison control hotline at (888) 426-4435. 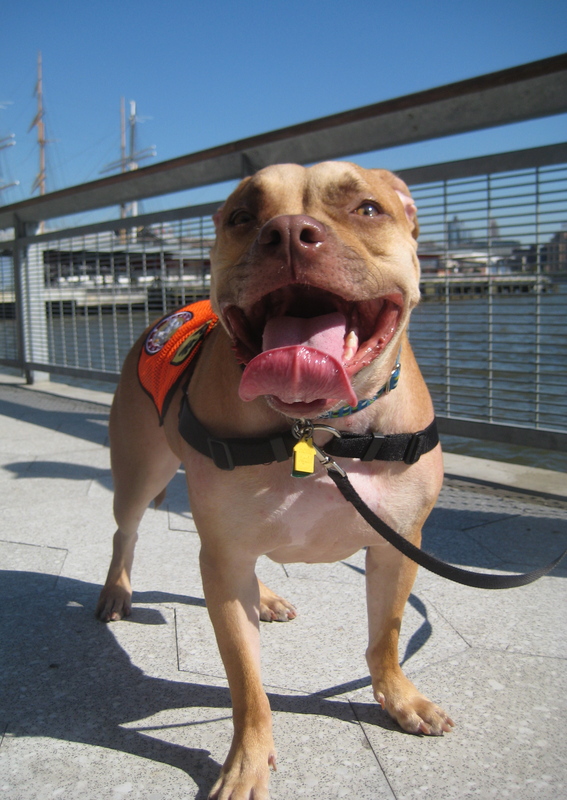 Every Monday, we are going to highlight an adoptable pit bull like dog from here in the New York City area. 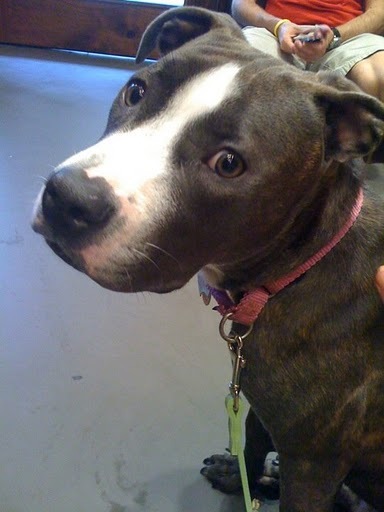 We are starting off with a beautiful girl named Phyllis, available for adoption through Animal Haven. 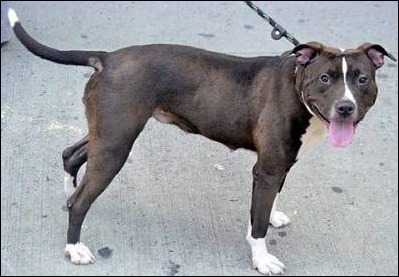 Several months ago, Jennifer and Josh went on a visit to Animal Care & Control in Manhattan to potentially pull a dog – though not necessarily a pittie. The dog we were initially interested in was not available to us, but we continued our visit to see who else was there. During that visit, Josh noticed Phyllis, then known as Alex, resting comfortably in her kennel. 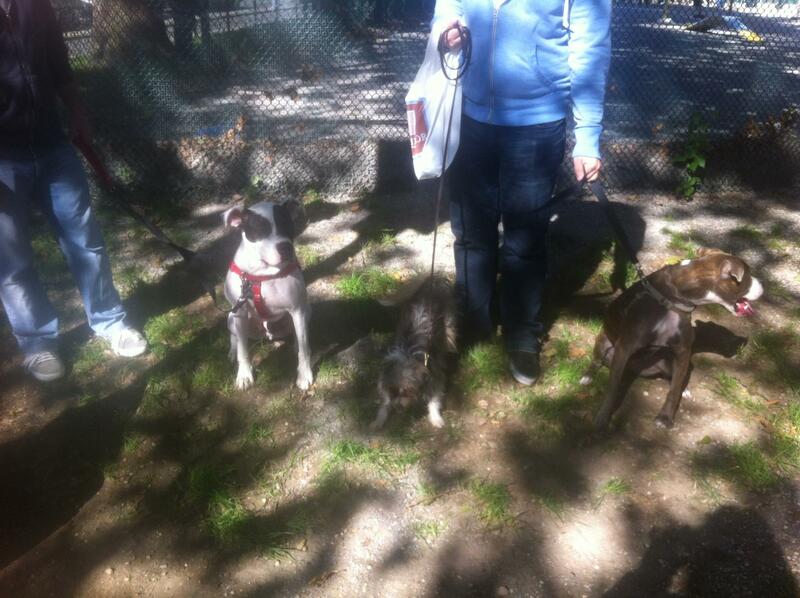 But we were all more taken with another pittie who was right next to her, and ended up rescuing him instead. Phyllis ended up staying at ACC for quite some time – but when her number came up for euthanasia, we contacted them immediately and she was on her way to safety! Phyllis is a wonderfully sweet girl with lots of energy and a friendly temperament. She’s spent time in a foster home, as well as at the shelter, and has been successful in both scenarios. We just can’t figure out why she continues to be overlooked – the face and the personality, this girl has it all. If you’re in or around NYC and looking for a great companion (or know someone who is), please go to Animal Haven and meet Phyllis – it’ll be love at first sight. Anyway, this really nice lady (dad said her name is Debora) found me on the street one day and she picked me up in her car and brought me to Animal Haven. I hung around there, did some really cool training on some really cool things – dad’s friend Jennifer calls it agility. All I know is that I had a blast doing it, and hope I get to do it some more. Then dad came and took me home, and starting calling me Lucy (I’m named after some lady called Lucille Ball, but also after a couple of characters in musicals). Life’s just been amazing since then! We go on car rides all the time (Oh! I LOVE CARS. I try to get into any one that is open when we’re out on the street), we go to training classes where I earned my CGC certification, and I have made lots and lots of cool doggie and people friends at both of dad’s jobs. Now dad’s been bringing home these other dogs. They’re pitties, just like me. I love having playmates at home, but they all end up leaving us after a little while. Dad says we can’t keep them, but I sometimes wish we could. But as the other ones come and go, I’m going to tell you what’s REALLY going on around here. All the good dirt. Keep reading and you’ll see my Letters from Lucy every now and then – and even more pictures on our Facebook and Twitter. 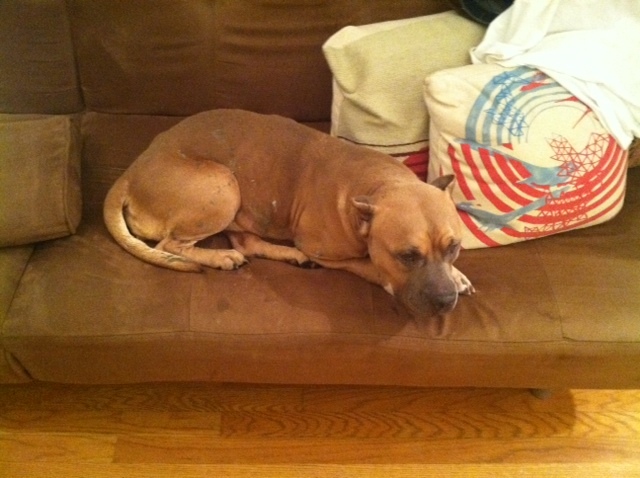 First up is going be our favorite foster so far: the resilient Miss Lola Bird. Celebrate! Tomorrow is National Pit Bull Awareness Day! It’s time to hug your pibbles and celebrate our favorite misunderstood breed! Take some time this weekend and celebrate! Volunteer and/or Donate: If you volunteer at a local shelter or rescue group, make sure to spend time with the pitties that are still looking for their forever home. Maybe even ask the shelter staff if you can take them on an extra long walk; a field trip to get extra exposure, or offer a special treat like a stuffed kong! If you aren’t registered to volunteer at a local shelter, you might consider making a special donation. Shelters are always in need of what most people might call the boring stuff – bleach, dish detergent, laundry detergent, even paper towels! Or, you can call ahead and ask if you can donate pittie-friendly toys such as black extra large kongs, bully sticks or marrow bones. Spread the love: If you are walking down the street, and see a pit bull-like dog, say, “Hello.” Why not compliment the good manners (if he/she has them) or ask where the dog was adopted from. People love to talk about their dogs. And, we often find that owners of pit-like dogs often get the opposite: stares and people crossing the street. You can also offer some helpful information like the ASPCA’s Operation Pit that provides free spay and neuters to pit bulls and pit-mixes. 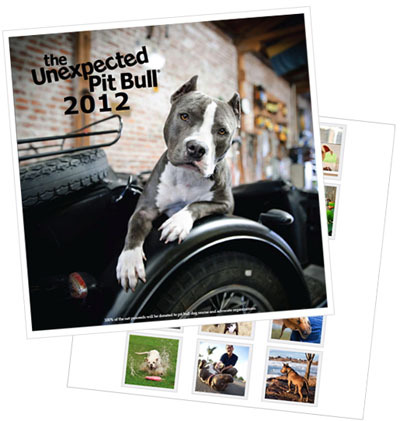 Celebrate in Person: Many local groups are hosting special pit-focused events. 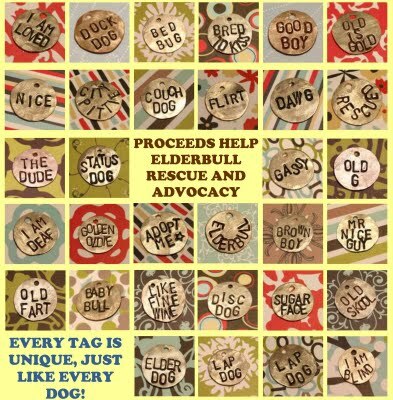 Take your pittie (and maybe some of his/her friends) on a nice long walk and show the public how great they are! Enjoy your weekend and give your four-legged friends a hug! Over the weekend, That Touch of Pit (along with our pups Lucy & Goose) took a trip across the river to a wonderful fundraiser for Liberty Humane Society in Hoboken, NJ called Bark in the Park. While there, we met up with our good friend (and foster dad!) Dan and his pittie Revis. We were amazed at all the wonderful pit bulls in attendance. This was a great surprise because at similar events in New York City, most of the four-legged attendees are small dogs. The afternoon included lots of vendors with great goodies- from boiled wool dog toys to the fabulous pit bull-themed jewelry and calendars from Pitbull and Itty Pitties, and many supportive local pet-centric businesses and local animal welfare organizations. 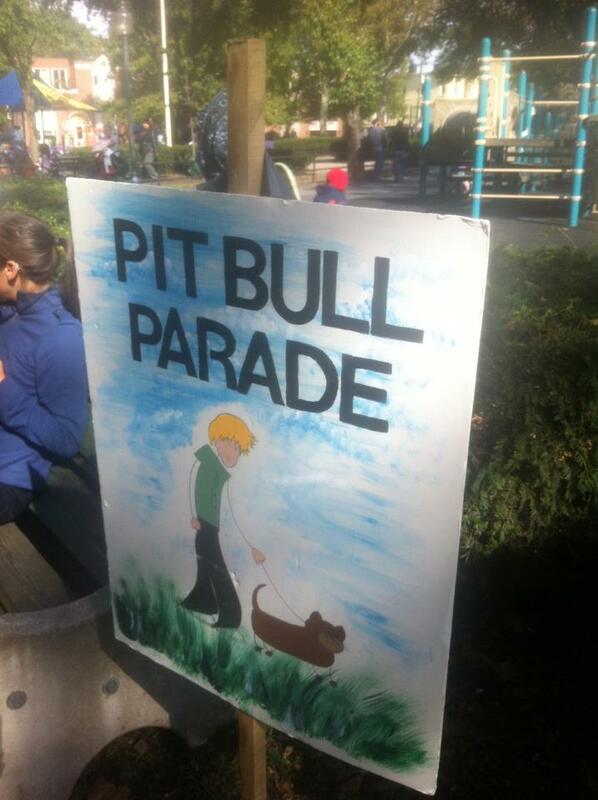 Unfortunately, we missed the “official” Pit Bull Parade but we did get to meet many of them strolling in the park. There were pit bull type dogs in every shape, color and age! One of the special guests at Bark in the Park was Oogy, the subject of a New York Times bestseller. Oogy, the poor victim of abuse, has overcome many challenges and is now loved unconditionally by the Levin family. It was a pleasure to spend time with this special inspiring creature. We bought a signed copy which was the perfect birthday gift for a friend – and all the proceeds went directly to Liberty Humane – the best type of shopping! Also in attendance were the Pinups for Pitbulls who were scouting for pinup pits for 2013! And, how can we forget all the adoptable dogs from Liberty Humane? Not only were the dogs walking around showing off their manners, many of them revealed that shelter dogs LOVE agility! We hope that some of the dogs found their forever homes on Sunday. Congratulations to all of the staff, volunteers and adopters at Liberty Humane! Check out more photos on Liberty’s FB Page! My first memory of a “pit bull” is of not being able to meet him because my godfather said he was not friendly and was kept in the basement when guests visited. Now I wonder if he was aggressive, aroused, or maybe missing some manners. Nonetheless, I never met him. Maybe he was under socialized, maybe under-exercised, or maybe he was hardwired to be aggressive. I will never know, but I do know that my godfather kept and loved that dog till the day he died. 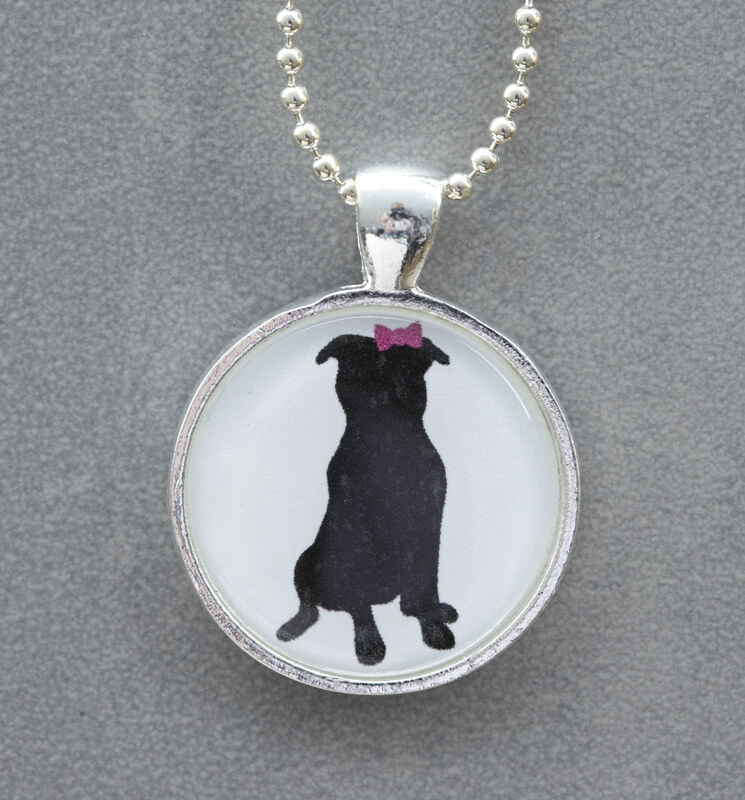 Since that experience, almost 20 years ago, all of my memories of bully like dogs have been wonderful – from the throw-away momma bleeding out from a bad delivery who only wanted to give me kisses as she was dying, to goofy pups playing at the dog run. I am an admirer of pit bull like dogs and a strong believer that these dogs need to be treated like individuals. 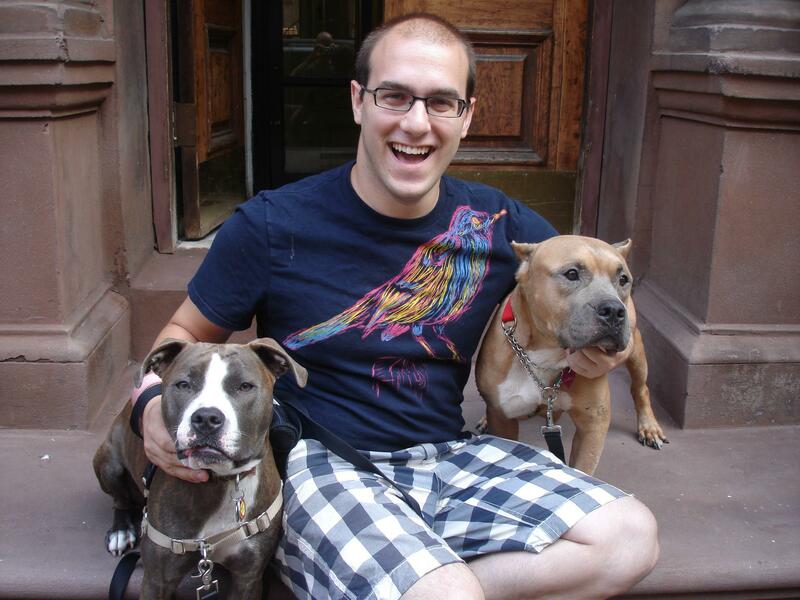 My love affair with these bully dogs started almost 10 years ago, when I landed a dream job working at a New York City private animal shelter. Part of the job is matching families and dogs. It is amazing to me that parents, busy as they are, want to bring a pup into their home. I am sometimes more excited for them than their children. Including kids in the adoption process is a challenge especially when parents were afraid that pit bulls would attack their children in the middle of night. I often found myself defending the “pit bull” like dogs, which created a great opportunity to open up people’s minds. 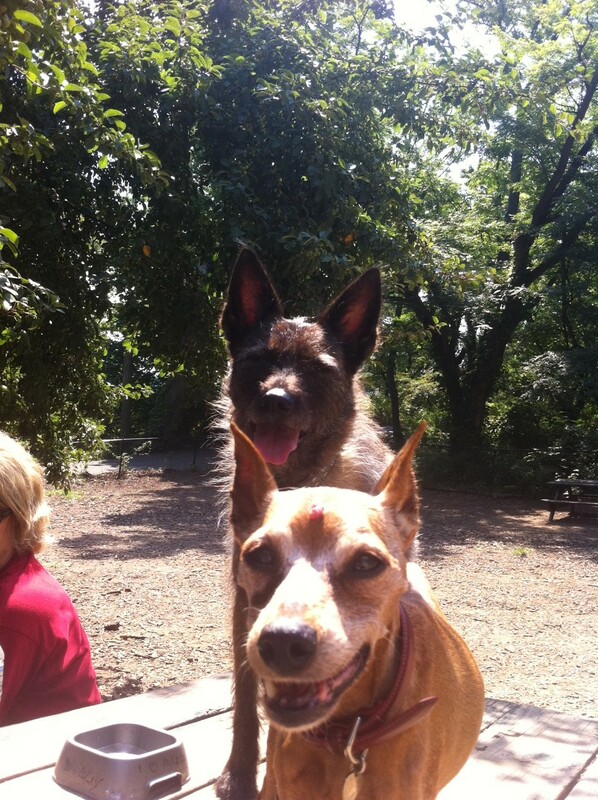 I love to talk and I can talk about dogs, dog training, rescue and pits forever – ask my friends at the dog park! My menagerie includes a 6-year-old smart as a whip cattledog/terrier named Bird, 4 year old clown of a terrier mix named Goose, a mature yet loud miniature pinscher named Rosie, and one orange sphynx who thinks he is a dog! 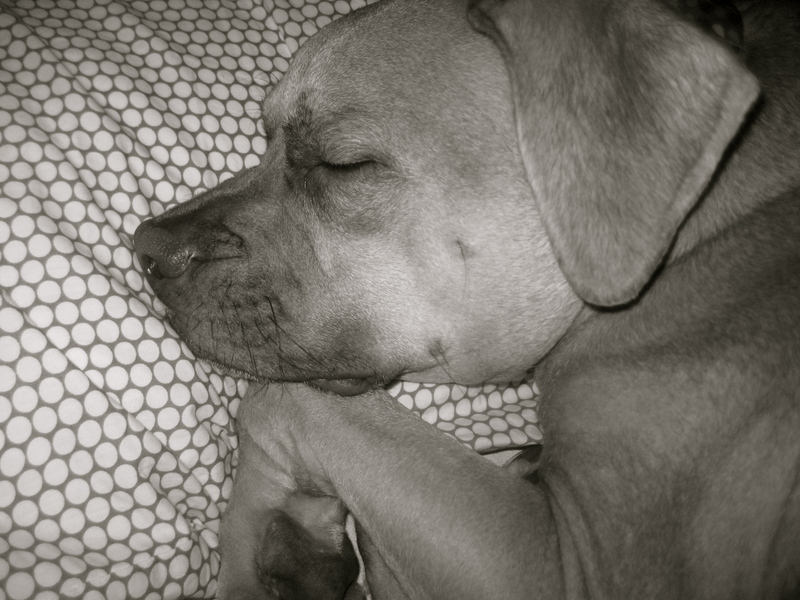 I think my lady dogs will like to share their home with a mature, mellow boy pibble that they can boss around…one day. I hope this blog will be an extension of my conversations about the breed that many don’t understand. Although I don’t share my home with with a pibble, I am the pittie stalker in the park. 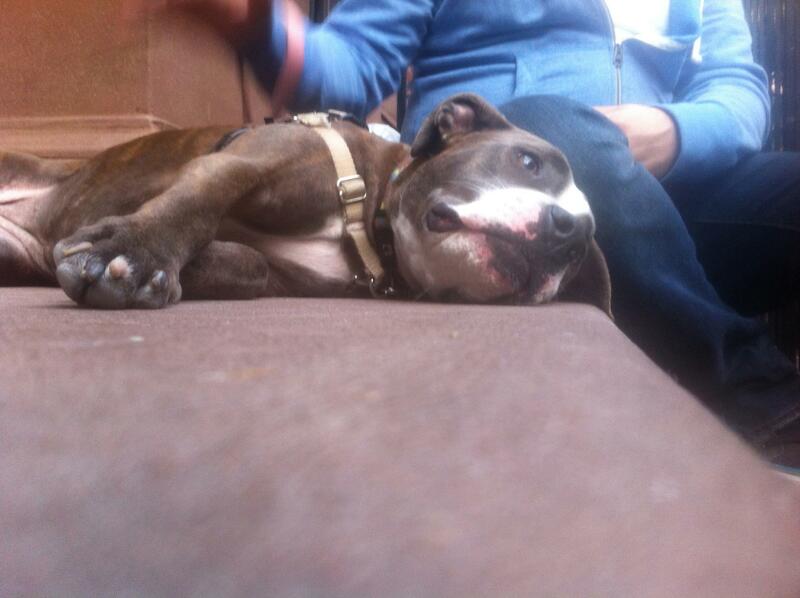 I am first to go meet the new pittie dog and owner. I often work hard showing skeptical dog owners how great that blue nose is with dogs, or what a soft personality the newly adopted brindle boy has. Yes, I am that person. I believe conversations can start change, and hope this blog helps. I am lucky to have that touch of pit in my life and I wouldn’t have it any other way. How I got from toy poodle to pittie mix I’ll never know – but I’m glad I took the leap. When I met Lucy, she was a curious and friendly puppy. She walked up to me, sniffed my hand, sniffed my face, and licked me from the bottom of my chin to the top of my forehead. I didn’t really have much say in the matter, the application was in my hand before I even had the chance to think about it, and it’s been amazing ever since. About a year later, I picked up Jim Gorant’s The Lost Dogs, and was incredibly inspired. What all those people did to help those dogs – I wanted to be just like them. So I decided to become a foster parent. 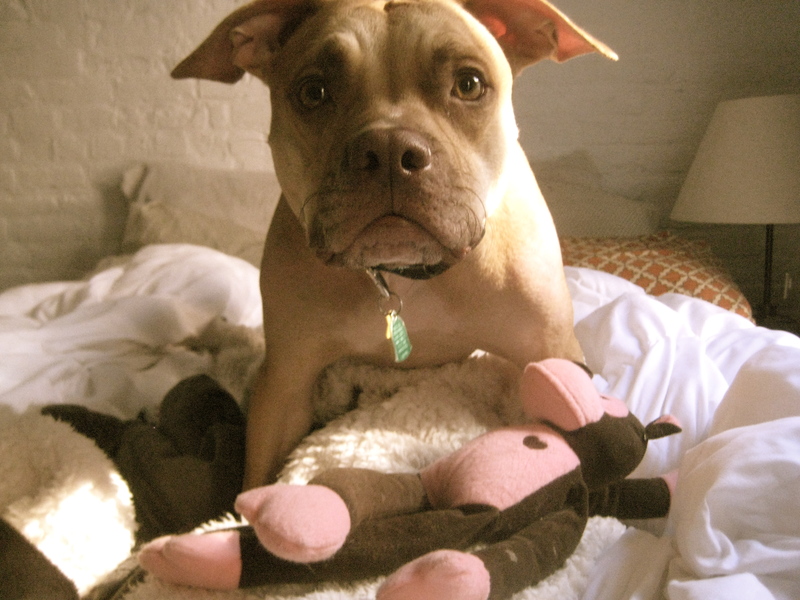 With this blog, I hope to show you what life is like as a pittie foster parent in the heart of Manhattan. As far as I can tell, there aren’t any blogs out there sharing this perspective yet. Sure, there are the foster blogs (like my idols at Love and a Six-Foot Leash) and the NYC pittie owner blogs (Two Grad Students and a Pittie), but hopefully I can share something a little bit different. 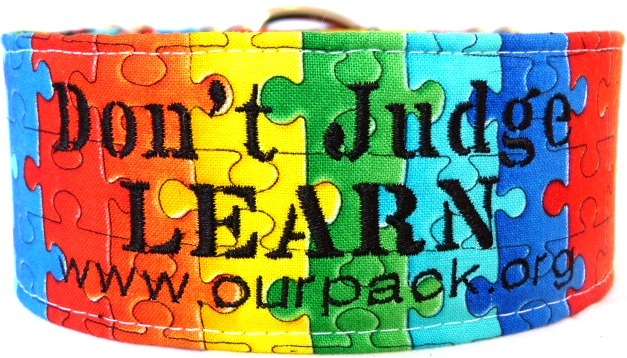 And along the way, I hope to learn. A lot. I already have learned tons of invaluable information from the blogosphere, so I will frequently look to you all for help and advice. So happy blogging – I’m so looking forward to this new adventure!